I am having MAJOR INTERNET PROBLEMS… we switched from Hughes Net to WildBlue / EXCEDE by ViaSat but the INTERNET is down more than it is up. Had a short podcast ready to go but can not post anything. I am currently at work using the wifi or I go to McD to keep up on email. Repair guys coming on Saturday. They either have to fix it or take it down. Hopefully be back next week. 1.“[Repetition] provides visual clues to help move the eye about the picture. Similarities in elements reinforce the viewer’s recognition of symbols, strengthen the rhythm, encourage movement, and produce patterns. Introduce variations of repeated elements to prevent boredom.” (Liz Berg handout entitled Principles of Design from “Design the Abstract Quilt” workshop). The most obvious repetition in this quilt are the colors. The bright lime green and the gold border colors were taken from the colors on the panel, echoing the colors of the tiger, the lion and the trees. 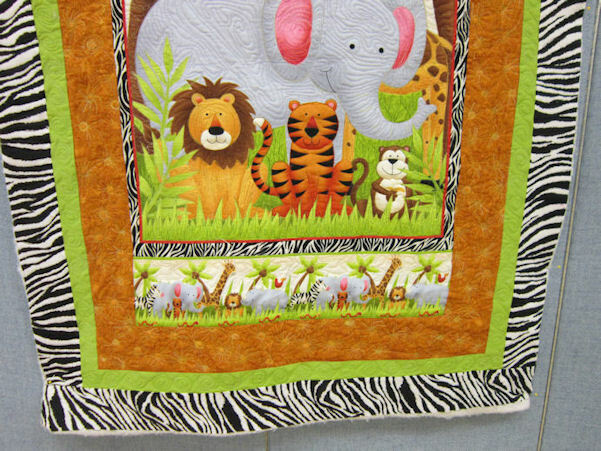 The small zebra print that is part of the panel is repeated and echoed in the large zebra print border that was added to the panel. The binding will be made of this same fabric, but be cut on the bias to accommodate a curved border. It is hard to see but many of the FREE MOTION QUILTING MOTIFS repeat and echo the patterns in the motifs. I was trying to accentuate and highlight the panel’s elements. I also think that using the same color instead of contrasting the colors in the FMQ is an element that enhances repetition. The small animal border on the top and the bottom of the panel echos the theme of the main motif of the panel. The same trees and animals are repeated but there are some new animals are added. If I can think of any more elements that depict REPETITION in this quilt I will update this post. But it is just a simple little quilt. I finished the free motion quilting on my daughter’s baby quilt. I am in the process of sewing on the binding. First think I should say is that I should have taken better notes while quilting and this blog post would not be such a mis-match of random comments. Several things happened while I was FMQ but I can not remember the specifics. I hope to do better next time. I am not including the overall picture of the quilt on this post as I plan to post a part 2 to this blog tomorrow. DETAILS: In the sky I used a pastel blender thread that matched the background but also had areas of blue, pink and yellow. For the green border I used a wonky swirl pattern because I learned when I practiced without marking my swirls were wonky… so I went with that. I used black thread to follow the pattern of the black and white zebra print. If I wondered into the white area with the black thread it looked planned, even if it was a mistake. I had tried the white thread to quilt the white striped but it looked horrible if I wondered onto the black stripes. Always check the thread path when you thread your machine. My thread would break several times while quilting. I finally figured out the thread was getting caught on the lip of the spool causing excessive tension to the point of breaking the thread. Once or twice the spool would jump off the thread stand and get hung up in the top part of the holder. Threads should be free flowing so check your spools for any crevces where the thread can break. I use thread I have even if it is older as long as the color is what I need. I do not have trouble with the thread fraying or breaking as much as I have trouble with the spools. I get around this often by loading a bobbin with the thread and using it on the verticle spool pin. I have been reading, studying and viewing the DVDs of all the best FREE MOTION QUILTERS around. But some of their tips did not work. I finally called the shop where I bought my machine and got their recommendations. My best advise is KNOW YOUR MACHINE. READ your manual, take the classes at the shop where you bought your machine. 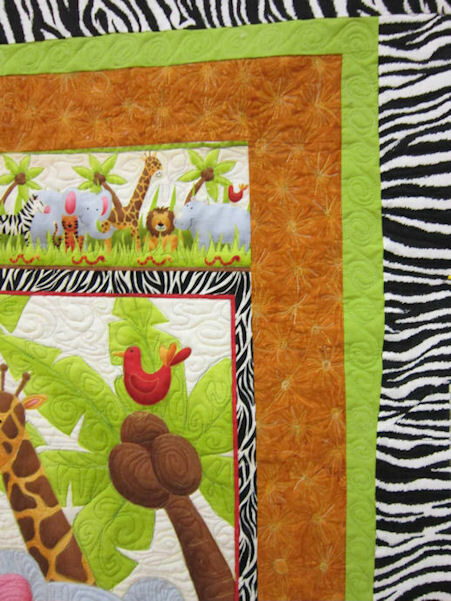 Not possible check out the blogs of quilters who use your machine and do work you admire, ask questions. Most quilters will try and answer your quilters. There are a lot of forums or yahoo groups with people who use your machine and they will usually help you. 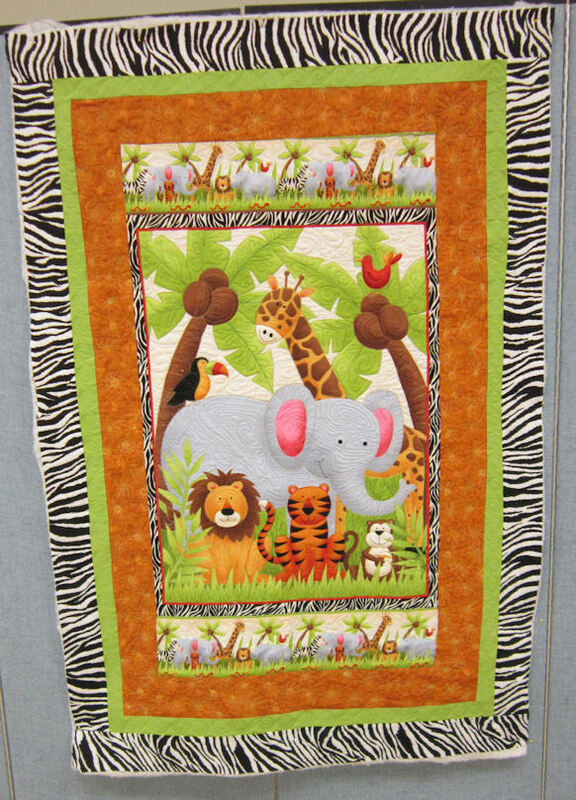 I followed the advise of my quilt shop and Sue Nickles who also used my machine in her project and my FMQ IMPROVED!! When I had taken Sue’s class I had written notes in the fly leaf of her book and I dug it out and reviewed it. MY ADVISE IS KNOW YOUR MACHINE AND PRACTICE, PRACTICE, PRACTICE. When I started my FMQ adventure, I put 60/wt 3 ply thread that is very fine but very strong. Regardless of how I adjusted the tension the bobbin thread would come to the top and ladder or make bumps. I had wanted the bobbin thread to match and blend with the backing fabric but that looked horrible on the front of the quilt. Every bobbin stitch could be seen as little bumps or pin dots. Matching the threads to the top worked much better. There may be a way to accomplish what I wanted to do but I do not know what it was. I plan to review all my DVDs again befor I do my next FMQ project. PRACTICE, PRACTICE, PRACTICE… I tried each of the different motifs before I put them on the quilt. I improved only after practicing. My motifs are still kind of WONKY, but by the end they all looked better. SUPER SLIDER HELPED! 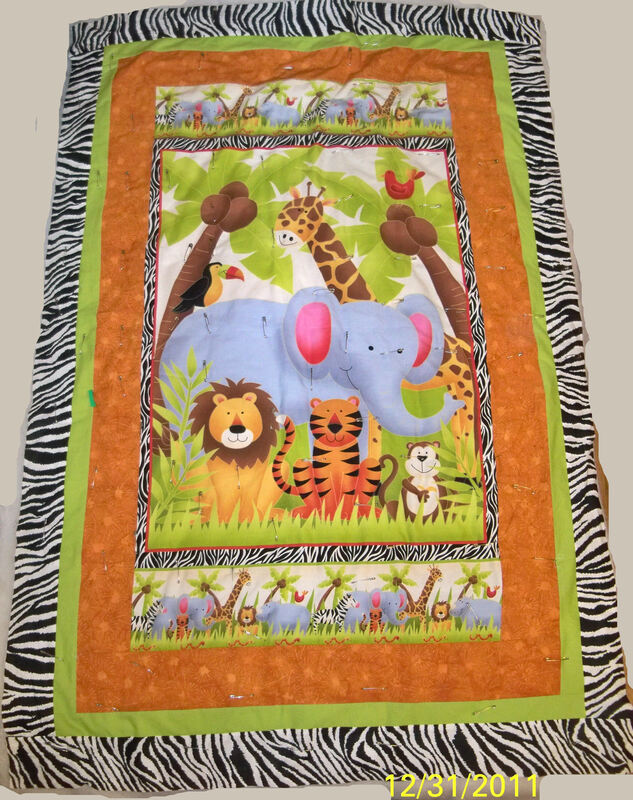 I have a super slider that allows the quilt to move easily on the surface. I always concentrated on the small area under the needle. I made sure my quilt would allow movement and would not get hung up. If there was tension from the weight of the quilt I noticed my motifs looked worse. Finger Cots or Gloves helped me move the quilt easily with just light pressure. I found I liked the gloves better as my rings kept sliding around when I wore the finger cots. I have never taken my rings off so I either have to tape my rings or wear the gloves. I had not problems with my hands getting hot so I ended up wearing my gloves. YOU HAVE TO FIND WHAT WORKS BEST FOR YOU. I had a blast learning and doing FMQ and plan to continue on this adventure. I am already planning my next project. 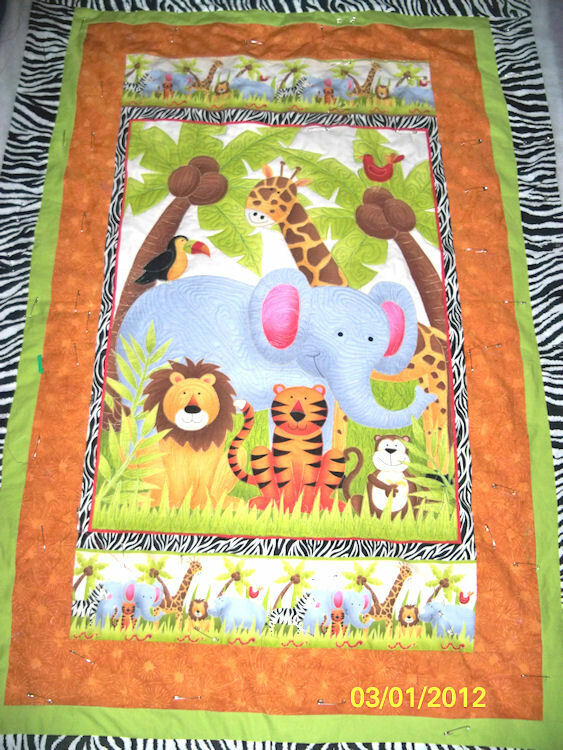 I do think I OVER-QUILTED this baby quilt and in the future I plan to avoid doing that< especially for baby quilts. FYI: I plan to podcast as soon as I get my voice back. I started an episode but now have a rip roaring cold and lost my voice. I may just post short episodes as I have several topics I want to discuss but they do not go well together. We will see. Although I have been studying and doing a few small pieces of free motion quilting over the years, I was never very serious about FMQ. It would be something I was playing with. 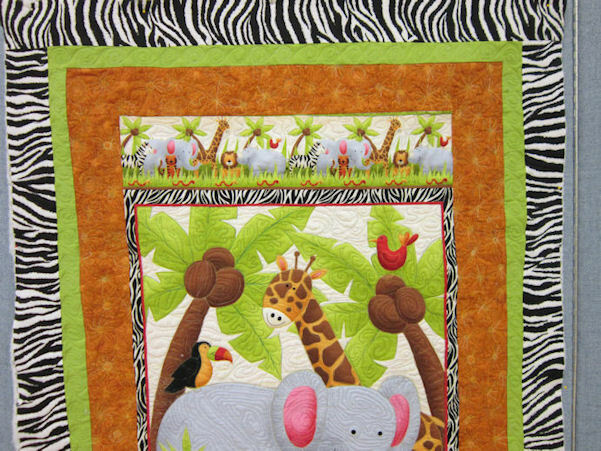 I still will take my really big quilts to a long armer, why wouldn’t I when I have several talented nationally known long armers in my quilt. ( Links to be provided) This year I want to really work at FMQ on my own as I feel that it is a talent I want to learn and will need to know. 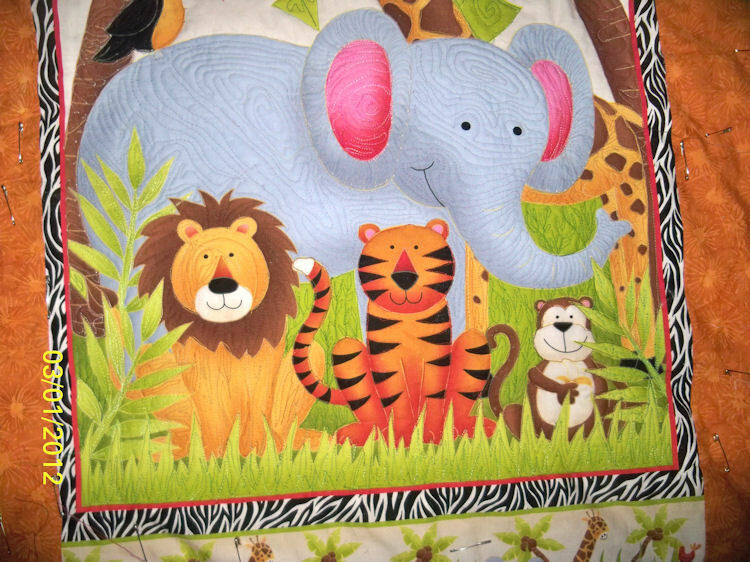 I will retire someday and will not be able to afford to have the quilts done by a long armer. 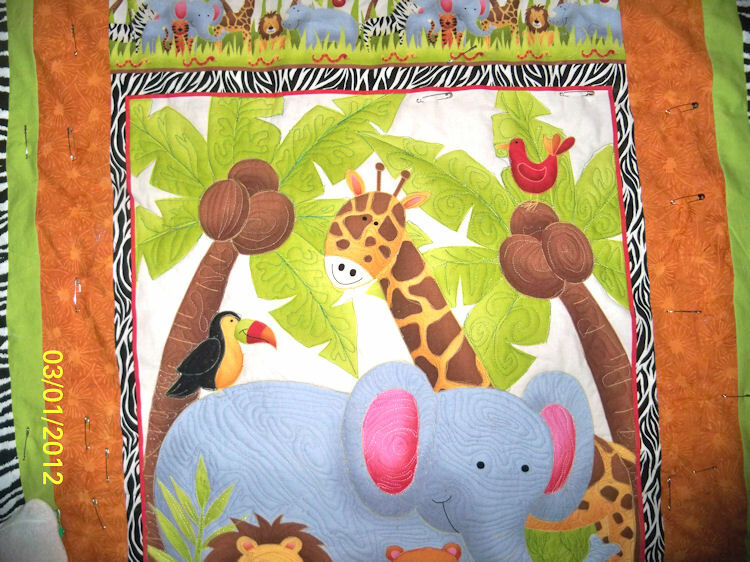 I also like to make baby quilts and those are small enough for me to do. I have been studying Leah Day’s BLOG and her current FREE MOTION QUILT ALONG. She discusses quilting on real quilts. I do not plan to go into detail on what I have learned on this post; but I will address it in the future. Today I am just posting the pictures of what I have accomplished so far. Frankly, it is too late at night to go into any detail. I will be back over the weekend after classes to update this post … so check back again.